Notes about the Hutt Park Railway Company. The line ran from Petone Junction to a point near the Hutt River and should not be confused with Hutt Park on the Gracefield Branch. Information about Hutt Park and about race trains can also be found on my Hutt Park Race Trains page. Clearly I need to rationalise these pages. The purpose of the Hutt Park Branch was to improve access to Hutt Park, particularly for meetings of the Wellington Racing Club (WRC). The WRC was coming under threat from the Wellington Jockey Club, which was holding race meetings at Island Bay. The railway was constructed little over a month after someone connected with the WMR became involved. The railway seems to have achieved its aim. From its opening in 1885 until 1905 special trains ran from Te Aro to Hutt Park for Wellington Racing Club (WRC) meetings. The WRC had four meetings a year, of one or two days each. In addition, shortly after the railway opened the Wellington Jockey Club was forced to sell its Island Bay property. According to Quail the electric tram reached Island bay on 2 Dec 1905, just before the WRC moved to Trentham. This means that from 1885 to 1905 the WRC had a competitive advantage in the form of the Hutt Park Railway. In this sense the railway was successful. There is an interesting letter on file to the NZGR GM. It is in reply to a "please explain" after hundreds of passengers were left behind after the last train departed Hutt Park. It is not clear how these people got home! Financially it may have been a different story. The Welington Racing Club believed that the Hutt Park Railway's fares were too high. 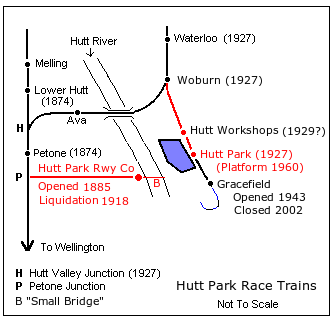 In 1904 the WRC asked the NZR to build a line parallel to Whites Line, across the river and to Hutt Park. This is approximately the line of the current railway. This became irrelevant in 1906 when the WRC moved to Trentham and race trains no longer needed to use the Hutt Park line. My research into the period after 1906 is limited. Maybe the occasional special ran for specific events? It may have been that fares requested by the Company to cover costs were too high. I do not know. In any case, the railway's reason for existance had disappeared. An Extraordinary General Meeting in 1915 recommended that the company be wound up. In 1918 the company went into liquidation. Reserves and Other Lands Disposal and Public Bodies Empowering Act 1915 1915 No 68. An Act to provide for the Exchange, Sale, Reservation, and other Disposition of certain Reserves, Crown Lands, Endowments, and other Lands, to validate certain Transactions, to confer Powers on certain Public Bodies, and to make Provision for certain other Matters. The relevant section of the act is 137. Petone Wharf In the early part of the 20th century the Wellington Harbour Board and the Petone Borough Council wanted to construct a Railway wharf. The Harbour Board would do so only after the Railways Department had purchased the Hutt Park Line. The Railways Department would agree to purchase the line only after the Hutt Park Railway Company had brought the line up to standard (the line was in worse condition than a branch line.) The company would not upgrade the line. Eventually the existing "cart only" wharf was built. There was much pressure on the government of the day to purchase the line. Night Soil In 1908 the only use of the line was to the Gear Meat Co manure works (on the site of the current Lever Bros factory) and a Petone Bourough Council truck (horse pulled?) that ran every night taking night soil to the Borough sanitary depot. I have not yet determined the site of this depot. Gear Island There was a proposal to turn gear Island ito an industrial area with rail access. For the project to proceed the government had to purchase the Hutt park Railway so that it was part of the national railway system. Hutt Park Township The Hutt Park Railway Co constructed a 147 lot development adjacent to its Hutt Park Station. On sale day 100 of the lots sold immediately at the auction held in Wellington. The lots fronted Kircaldy St and the Esplanade. An example of the betterment principle? Port Competition There was competion between the Hutt and Wellngton over port facilities either at Gear Island or Evans Bay. The Gear Island option would have had extensive rail sidings. Randwick Settlement There was a proposal to extend the Hutt Park Railway over the Hutt River to give access the a settlement in the Randwick area. Litigation The railway was approved by the Petone Town Board to carry passengers to Hutt Park - although there is a statement that the line was constructed illegally. After 1905 the railway no longer served the purpose it was built for and the Petone Borough Council wanted the company wound up. A complicating factor was that the Hutt Park Railway Company had leased the line to the Gear Meat Co. In 1915 the Council took legal action in the courts against the Hutt Park Railway Company and the Gear meat Co. The words writ, declaratory judgement and injunction were used but not being a lawyer I do not know the significance of the terms. The issue was solved by an act of parliament allowing the Gear Meat Co to purchase the line. I do not know if the case reached court. Closure I have spoken to an old identity who worked at the Gear Meat Co and remembers trains to the manure siding. That suggests that the eastern end of the Hutt Park Railway was in use until at least the 1930s/1940s. The eastern end closed in the 1980s(?) when the freezing works closed. 137 Arrangement between the Petone Borough Council, the Hutt Park Railway Company (Limited), and the Gear Meat Preserving and Freezing Company of New Zealand (Limited) regarding the Hutt Park Railway. (1) Within two months from the passing of this Act, notwithstanding anything in their respective memoranda of association, the Hutt Park Railway Company (Limited) and the Gear Meat Preserving and Freezing Company of New Zealand (Limited) may enter into a contract for the sale by the former company to the latter company, at a price to be mutually agreed upon, of that portion of the said railway-line lying between the point of connection with the Government railway-line and the production seawards of the western boundary-line of Victoria Street, together with the lands held in fee-simple by the Hutt Park Railway Company (Limited) and comprised in certificates of title, Volume 81, folio 213, and Volume 87, folio 47. (a) The said lands comprised in certificates of title, Volume 81, folio 213, and Volume 87, folio 47, shall by force of this Act vest in the Gear Meat Preserving and Freezing Company of New Zealand (Limited) for an estate in fee-simple. (b) The portion of the said railway-line described in subsection one of this section, and the existing sidings leading therefrom to the works of the Gear Meat Preserving and Freezing Company of New Zealand (Limited), shall by force of this Act vest absolutely in that company and its assigns; and, notwithstanding anything contained in any other Act or in any rule of law, that company and its assigns shall at all times have the sole and exclusive right of user and enjoyment of the said portion of line of railway as connected with the Government railway-line at Petone and of the said sidings for the purpose of carrying goods and chattels to and from the works of the Gear Meat Preserving and Freezing Company of New Zealand (Limited) and for shunting purposes. The rights conferred by this paragraph shall be appurtenant to the said works, and may be assigned therewith. Provided, however, that if any damage is thereby caused to the surface of the highway the Gear Meat Preserving and Freezing Company of New Zealand (Limited) or its assigns, as the case may be, shall forthwith make good the damage so caused. (d) It shall be lawful for the Gear Meat Preserving and Freezing Company of New Zealand (Limited) and its assigns at any times, with the consent of the local authority for the time being having the control of the said highway, to construct and connect with the said portion of the said railway other sidings to the said works, either in substitution for or in addition to its existing sidings or any of them, and the provisions of paragraphs (b) and (c) hereof shall apply to such further sidings. (e) It shall be lawful for the Gear Meat Preserving and Freezing Company of New Zealand (Limited) at any times with the like consent to alter the position of or raise or lower the said portion of the said railway-line and sidings or any part thereof respectively where laid upon the said highway. (f) The parts of the Beach Road or Esplanade upon which the said portion of the line of railway and sidings are or may be laid shall be and remain a public highway as fully and effectually as if the said line of railway and sidings had never been laid thereon, but subject, however, to the property and interests hereinbefore vested in and the rights hereinbefore conferred upon the Gear Meat Preserving and Freezing Company of New Zealand (Limited) and its assigns; and the Petone Borough Council shall have full power at all times to lay or alter pipes, conduits, or other appliances under the said line of railway or sidings where laid on the said highway; provided that in so doing there be caused no undue interference with the traffic on the line or sidi ngs and that the said Council forthwith makes good the highway. The Gear Meat Preserving and Freezing Company of New Zealand (Limited) shall be under no obligation to keep any part of the said highway in repair. Provided that the Gear Meat Preserving and Freezing Company of New Zealand (Limited) shall itself take up and remove the siding leading to its old manure-works, and that the materials of such siding and of the points thereof shall be and remain the property of that company. The land upon which the portion of the said line of railway defined in paragraph (g) hereof is laid, and the whole of the said Railway Parade, as shown on the plan deposited in the Land Transfer Office at Wellington as No 384, shall thenceforth be a public highway freed from any estate or rights theretofore owned or held by the said companies or either of them. Provided further that for the purposes of sections eighty and eighty-three of the District Railways Act 1908 [Repealed], the portion of the said line of railway described in subsection one of this section shall be deemed to have been opened for traffic for upwards of twenty-one years. (j) The Hutt Park Railway Company (Limited) shall be and is hereby declared to be discharged and released from all liability in respect of any contract entered into by it with His Majesty the King in respect of the said railway, and in respect of any obligation imposed on it by the District Railways Act 1877, or any amendment thereof, or by the District Railways Act 1908 [Repealed]. (k)The said action shall be discontinued, and each party thereto shall pay its own costs thereof. (3) In the event of the power conferred by subsection one of this section not being exercised within the period in such subsection mentioned the said action may be proceeded with as if this Act had not been passed. (4) The Mayor, Councillors, and Burgesses of the Borough of Petone shall pay to the Gear Meat Preserving and Freezing Company of New Zealand (Limited) a rental at the rate of [one hundred and fifty dollars] per year for the use had by the Council of that borough of the said line of railway, such rental to be computed from the fourteenth day of July, nineteen hundred and thirteen, to the time when the Council shall have substantially commenced to take up the portion of the line referred to in paragraph (g) hereof. (5) Nothing in this section shall give the said companies, or either of them, any right to connect the said railway-line with any Government railway-line except in pursuance of an agreement entered into with the Minister of Railways in terms of section forty-one or section forty-two of the Government Railways Act 1908 [Repealed]. Notes I published on a mailing list. Open for regular passenger traffic 1885. Regular race traffic (four meetings per year, some of two or three days) until 1905. Passenger traffic probably insignificant after 1905. Railway sold to Gear Meat Co and lifted from Petone Wharf to Hutt River in 1915 (is this ccorrrectr)? By 1915 (not sure when this began) the Gear Meat Co was using the line for transport between its main works and its manure works on the site that is now occupied by Lever Bros (near the Hutt River). The relevant section is 137. Finding it made hours of trawling through old records very satisfying.